This contrast-enhanced image was acquired at the Phoenix landing site on Sol 4 by Phoenix's Robotic Arm Camera (RAC). As seen in the top center, the exhaust from the descent engine has blown soil off to reveal either rock or ice, which has not yet been determined. TUCSON,Ariz. ? 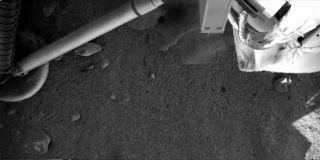 NASA?s Phoenix Mars Lander sent back images of the blind spotunderneath it today as mission scientists gear up for the craft's robotic armto touch the planet's soil for the first time. The spacecraft also encounteredits first glitch, with a short circuit in one of its instruments, missionscientists said at a briefing on Friday. Phoenix?srobotic arm was maneuvered so that the camera at the end of it could image the spaceunderneath the lander, which is a blind spot for the stereo camera on topof the lander?s deck. The images showed some interesting tabular formations, asrobotic arm co-investigator Ray Arvidson, of Washtington University in St.Louis, described them. "Wedon?t know what they are. They could be exposures of ice, or they could beexposures of rocks," Arvidson said at a briefing here at the University ofArizona. ?We're really pushing for ice, but we don?t know if that's the caseyet.? The$420 million dollar Phoenix mission is designed todig down to the layers of water ice thought to lie just under the surfaceof the north polar region of Mars, where it landed on Sunday. Instruments onthe spacecraft are designed to analyze soil samples to see if the ice was onceliquid and could have created a habitable zone for possible microbial life atsome point in Mars' past. Missioncontrollers have encountered a problem with one of these instruments, theThermal and Evolved-Gas Analyzer (TEGA) that is designed to heat up soilsamples until vapors come off and then to analyze those vapors to detectthe composition of the soil. Theglitch seems to be a short circuit in a filament in a part of the instrumentthat ionizes the vapors before they are sent to the detector, said TEGAco-investigator William Boynton of the University of Arizona. There are twofilaments in the detector however, and TEGA scientists are now investigatingwhether they can operate the instrument with just the one filament. They willalso being sending up diagnostic instructions over the next few days. "We'requite optimistic that we have a workaround that will let us operate theinstrument," Boynton said. Meanwhile,mission scientists are also looking for more information on the soil near thelander so that they can begin digging for samples. The first step will beimaging all three of the landers' footpads with the robotic arm camera to makesure the craft is stable on the ground, mission scientists said. Afterthat, mission scientists plan to perform a "soil touch," whichinvolves moving the scoop at the end of the robotic arm and making a dent inthe soil, then turning the scoop around and imaging the dent to make sure thatcontrollers know how to reach the soil, Arvidson told SPACE.com. Thenext step will be to do what mission scientists call a "dig and dump"where they will practice having the robotic arm scoop up the soil and dump itdown again. Missioncontrollers are waiting to get data back from Phoenix?s Friday night downlinkon one of the proposed ?dig and dump? sites to decide when and where to performthe soil touch maneuver. Clickhere for SPACE.com'sPhoenix mission coverage and a linkto NASA TV.